Purpose: To develop and test the sensitivity of an ultrasound-based sensor to assess the viewing distance of visual display terminals operators in real-time conditions. 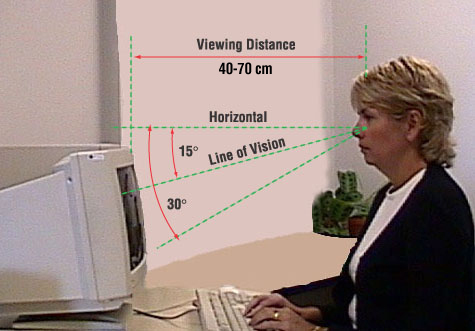 Methods: A modified ultrasound sensor was attached to a computer display to assess viewing distance in real time. Sensor functionality was tested on a sample of 20 healthy participants while they conducted four 10-minute randomly presented typical computer tasks (a match-three puzzle game, a video documentary, a task requiring participants to complete a series of sentences, and a predefined internet search). Results: The ultrasound sensor offered good measurement repeatability. Game, text completion, and web search tasks were conducted at shorter viewing distances (54.4 cm [95% CI 51.3–57.5 cm], 54.5 cm [95% CI 51.1–58.0 cm], and 54.5 cm [95% CI 51.4–57.7 cm], respectively) than the video task (62.3 cm [95% CI 58.9–65.7 cm]). Statistically significant differences were found between the video task and the other three tasks (all p < 0.05). Range of viewing distances (from 22 to 27 cm) was similar for all tasks (F = 0.996; p = 0.413). Conclusions: Real-time assessment of the viewing distance of computer users with a non-intrusive ultrasonic device disclosed a task-dependent pattern.